The insurance firm heads to Czech Republic for staff event. Pre-event planning: Insurance firm Axa Personal Lines Insurance wanted to take staff and their partners to Prague for a meeting and team- building event. 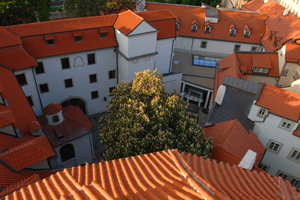 The company used Ideal Venues to find the venue, which put it in touch with DMC Liberty Incentives & Congresses Prague. Axa decided to accommodate guests in Rocco Forte's Augustine Hotel, a former monastery that reopened as a luxury hotel in 2009. A programme was created to offer a mix of modern activities, such as trendy restaurants and ice sculpting, against the city's historical backdrop. Challenge: Staff and their partners would be separated for the main morning meeting session, so entertainment had to be arranged for the spouses. Solution: Staff and their partners arrived at the hotel, before heading to a welcome dinner at the Blue Duck restaurant. The next day, staff attended a morning meeting in the hotel, while their partners were whisked to the Manto Gallery to meet the Czech artist, Antonin Manto. They viewed his artwork before trying to create their own, decorating a glass fruit plate. Once finished, the plate was fired overnight and given to guests on their departure from the hotel. Lunch was at the Celeste Bistro, a new trendy sister restaurant to the famous Celeste, where guests would eat in the evening. In the afternoon, staff and partners were taken to the exclusive Lobkowicz Palace, accessible by walking through Prague Castle. Six ice cubes, each weighing 130kg and 1m tall, were waiting for the guests, who were challenged to create another piece of art. After an hour and half, the delegates admired their sculptures while drinking shots of Czech liqueur Slivovice, served in ice glasses. Delegates were treated to a farewell dinner at the Celeste restaurant, which serves modern French cuisine with stunning 360-degree views of Prague on its summer terrace. Post-event analysis: Axa Personal Lines Insurance event consultant Dawn Severn says she was pleased with the agencies, venues and overall event. "Liberty Incentives did a fantastic job from start to finish, looking after every detail - restaurant recommendations, transport options, spouse programmes and the incredible ice-sculpting activity that they managed to get permission to hold in Prague Castle. We were delighted with every aspect of this event put together by the Liberty Incentives team."